The look of yesterday with the technology & sound quality of today - plays LPs, 45s, 78s, cassettes, CDs & even iPods® or MP3 players! 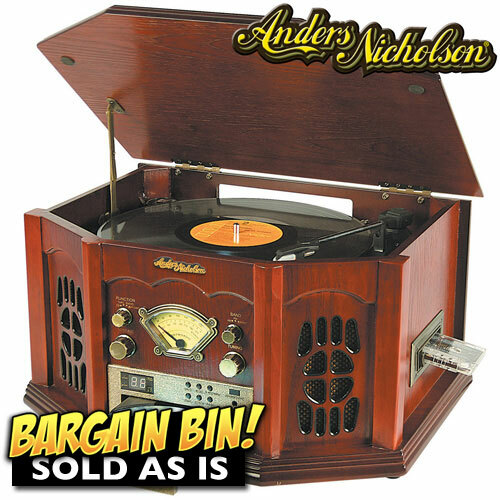 Anders Nicholson's® nostalgic home stereo combines yesterday's classic look with today's advanced technology! These stereos have an open box and SOLD AS IS. No returns accepted. They have mechanical and cosmetic issues preventing standard operation. It does not function to its original standards and may need additional servicing and parts. Their CD players have components that do not work. With a little know-how and some elbow grease, this Bargain Bin stereo could be a steal! Bring out those old LPs & singles ... and don't forget your favorite CDs & cassettes. This unit plays them all! Whether you're listening to the radio or your favorite CD, this stereo unit fills the room with terrific sound. Quality crafted throughout, it features a turntable that plays 33-1/3, 45, and 78 records, an aux input for iPod* or other MP3 player, front loading full-function CD player, AM/FM stereo radio & LCD display. It has a cherry finish wood case that measures 17-3/4" x 13-1/4" x 9-1/2". * iPod, iPod mini, iPhone and iPod photo are trademarks of Apple Inc., register in the U.S. and other countries. NOTICE: Heartland America was fortunate to secure a limited allocation of these fully loaded nostalgia turntables. We urge you to order early to avoid disappointment. Product photo may vary. This is a customer return. Customer returned items have a 7 day return policy.